Gluten free. Low fat. No artificial colours, flavours or preservatives. Vegetarian Society Approved. "Inspired by our own country garden in Scotland, this soup celebrates the best of seasonal produce. 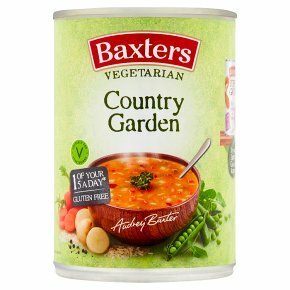 Seven different vegetables and three of our favourite herbs make this delicious soup an easy way to squeeze in 1 of your 5 a day!" Audrey Baxter 1 of your 5 a day* *Per can. Aim for at least 5 different portions of fruit or veg a day.